Obesity is associated with ectopic fat deposition in various organs and tissues that may adversely affect their structure, and their metabolic function. 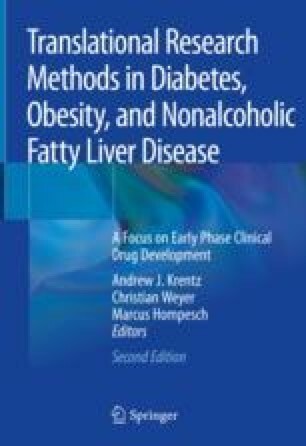 In the context of developing new drugs for nonalcoholic fatty liver disease and related cardiometabolic conditions (obesity, type 2 diabetes, cardiovascular disease, metabolic syndrome), non-invasive quantitative imaging biomarkers have been developed to estimate hepatic steatosis, percentage and type of fat accumulation in skeletal muscle, and absolute and relative amounts of muscle, and subcutaneous and visceral body fat. Advanced magnetic resonance imaging (MRI) is widely considered to be well suited, and the preferred non-invasive method to estimate proton density fat fraction (PDFF), an accurate and precise biomarker of hepatic steatosis. Magnetic resonance spectroscopy (MRS) is currently the only non-invasive method to assess intramyocellular lipid (IMCL), a biomarker of fat accumulation within skeletal muscle cells. Finally, semi-automated MRI is emerging as the leading method to formulate an overall body composition profile (BCP), which provides a snapshot of fat and muscle composition in the body.